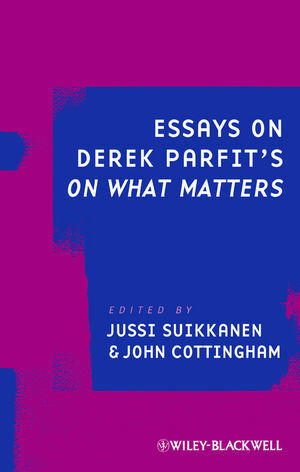 In Essays on Derek Parfit's On What Matters, seven leading moral philosophers offer critical evaluations of the central ideas presented in a greatly anticipated new work by world-renowned moral philosopher Derek Parfit. John Cottingham is Professor Emeritus of Philosophy at the University of Reading and an Honorary Fellow of St John's College, Oxford. He has written numerous books and articles on early-modern philosophy, has published extensively in the field of moral philosophy and philosophy of religion, and is Editor of Ratio, the international journal of analytic philosophy. Jussi Suikkanen is a temporary lecturer in philosophy at the University of Leeds. He recently received his Ph.D. from the University of Reading. He has published numerous articles in international philosophical journals on contractualism and consequentialism, reasons and value, the nature of moral properties, and moral psychology. 1. Introduction (Jussi Suikkanen, University of Leeds). 2. Naturalism without Tears (James Lenman, University of Sheffield). 3. Can There Be a Kantian Consequentialism? (Seiriol Morgan, Bristol University). 4. The Kantian Argument for Consequentialism (Michael Otsuka, University College, London). 5. Climb Every Mountain? (Michael Ridge, University of Edinburgh). 6. Might Kantian Contractualism be the Supreme Principle of Morality? (Gideon Rosen, Princeton University). 7. Desires, Values, Reasons, and the Dualism of Practical Reason (Michael Smith, Princeton University). 8. Should Kantians Be Consequentialists? (Jacob Ross, University of Southern California).